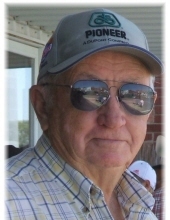 Duane Lockmon, 84 years old, of Rushville, Nebraska, passed away on September 2, 2018 at the Gordon Memorial Hospital. Duane was born near Denby, South Dakota to Emmett and Blanche Lockmon on July 30, 1934. He graduated from Rushville High School in 1952. He married Verlene Beck on June 5th, 1954. He started his own business immediately out of high school and worked as a machinist and blacksmith. He later expanded his business by including the sale of motorcycles, boats, snowmobiles, lawn equipment and accessories under the business name of the Rushville Service and Sports Center. He owned and operated his business for 55 years. During his business years he also ventured into the mining of mica in the Black Hills of South Dakota for a short time. Duane was involved in many civic projects and organizations in the community that he loved and took pride in. He was instrumental establishing the Rushville Rural Fire Department, the design and development of two new softball fields and the Sand Ridge Golf Course. He was a member of the Western Nebraska Cycle Club, Rushville Men's Bowling Association, Rotary Club, Chamber of Commerce, Pine Ridge Mutual Aid, Custom Cruisers, Highway 20 Antique Tractor Club, NW Nebraska Vintage Car Club, Pool Leagues of Chadron and Rushville and Golf Leagues. He proudly served for 33 years in the Rushville Fire Department, which he was the Fire Chief for 15 of those year, assistant Chief for 8 years, and on the ambulance crew for 8 years. In his "spare" time he also enjoyed fishing, hunting, playing cards and spending time with his family and friends. In his retirement years he especially enjoyed taking his dog Lolli for rides around town on the golf cart. Duane married Karol K. Kukal on December 28, 1982. They enjoyed 35 years of married life together. Karol remains at the home in Rushville. Duane is preceded in death by his parents, Emmett and Blanche; sisters Cleo Ainslie (Phy) and Lila Gillam (James), son-in-law Ken Hunter and first wife Verlene Simmons. Duane is survived by his wife Karol, daughters Tracy Hunter (Gary Jones) of Custer, SD, Vicki Ballard (Richard) of Gordon, and Deanne Armstrong (Mel) of Ozawkie, KS. Grandchildren; Eric Hunter, Ryan Hunter, Melissa Grover, Andrea Swiggum, Nick Armstrong, Nate Armstrong, Niles Armstrong, Alie Armstrong, and 10 great grandchildren. In lieu of flowers the family of Duane Lockmon has requested that memorials be designated to the Eric Hunter family for medical expenses for his fight against cancer or the Rushville Sand Ridge Golf Course and donations can be sent in care of Chamberlain-Pier Funeral Home, PO Box 366, Gordon, NE 69343. The family of Duane wishes to extend their sincere thanks to Dr. Charging Thunder and all of the staff at the Gordon Memorial Hospital.